Two dogs cloned by former stem-cell scientist Hwang Woo-suk will be donated to the National 119 Rescue Service. The service, which is one of the affiliated organizations of the National Emergency Management Agency, said Monday that it will receive the dogs under an agreement with the Sooam Biotech Research Foundation where Hwang is chief technology officer. Sooam Biotech signed a memorandum of understanding with National 119 Rescue Service on Dec. 26, 2012, on the preservation of pedigree rescue dogs by a technology called somatic cell nuclear transfer cloning. The agreement is intended to shorten the training period for rescue dogs and raise their training success rate. The two dogs that provided somatic cells are a male German shepherd born in 2007 and an English springer spaniel born in 2008. 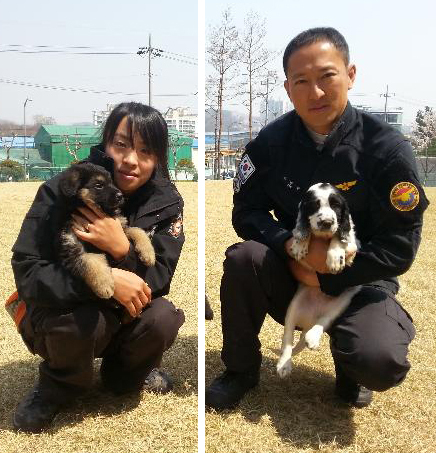 They belong to a fire station in Gyeonggi Province, and are known to have a good record of successful rescues. It is the second time for the Sooam Biotech Research Foundation to donate rescue dog clones to the National 911 Rescue Service. It received two dogs cloned from a German shepherd in December last year. The recently donated dogs will undergo two years of training before joining actual rescue operations.